5 billion is the sort of number that would make Dr Evil put a pinkie to his mouth. So Apple must be rubbing its hands with glee that its hugely popular iTunes store has hit this number of downloads and purchases. 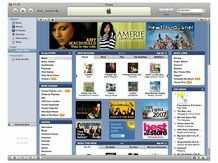 It was announced today that customers of the American version of the store itunes.com, which has the largest music catalogue at over 8 million songs, have downloaded over 5 billion music tracks. It is not yet confirmed if Leona Lewis' 'Bleeding Love' accounted for 99.9 per cent of those downloads. And if a near-total dominance of music downloads wasn't enough – where the site is trouncing its nearest rival Amazon.com 10 times over – it seems that Apple's movie downloads are also proving popular. According to recent figures, iTunes customers are now purchasing or renting 50,000 movies a day. This makes iTunes the world's most-popular online movie store, as well as the most popular music store.